While not documented on this blog, last year was a quest not only to learn how to bake, but to find a decent recipe for a loaf we liked enough to eat (almost) every day. It had to be easy enough to whip up, but not taste like supermarket sandwich bread. 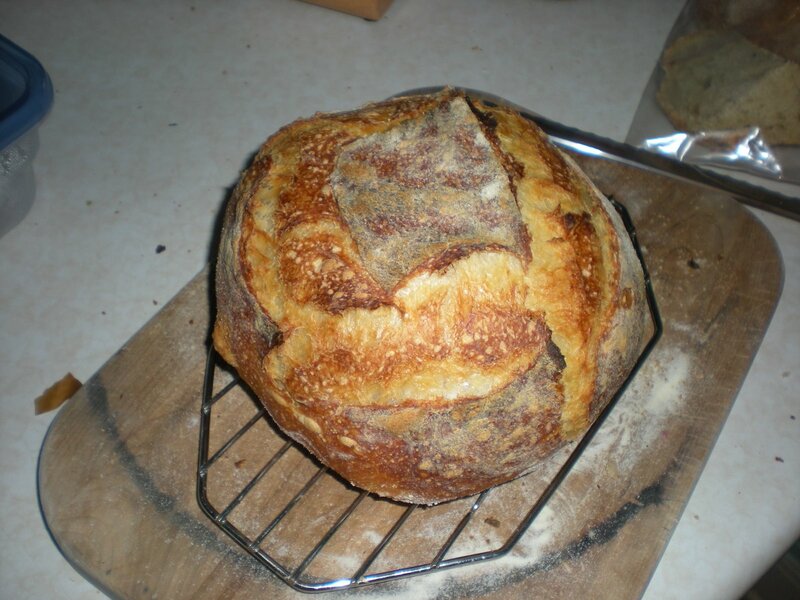 With the sourdough 1-2-3 I wrote about in the last post, I knew we had reached our goal. But what to do now? I had learned a great deal about different techniques and ingredients and was stuck on how to proceed. So I decided to do something completely crazy- find a bread type I knew nothing about, and was so completely different from the breads I had been making before. 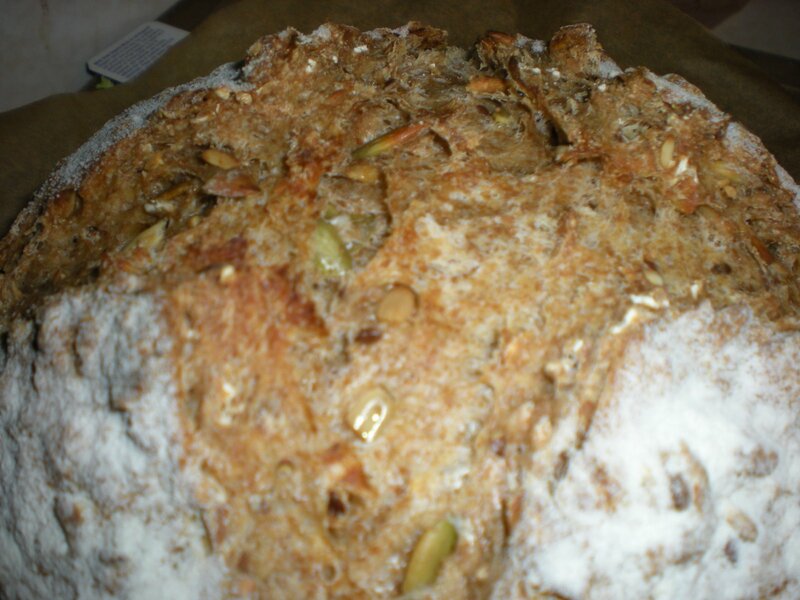 I would make a bread that was dense, not airy; mostly wheat not white; and full of delicious seeds and nuts. 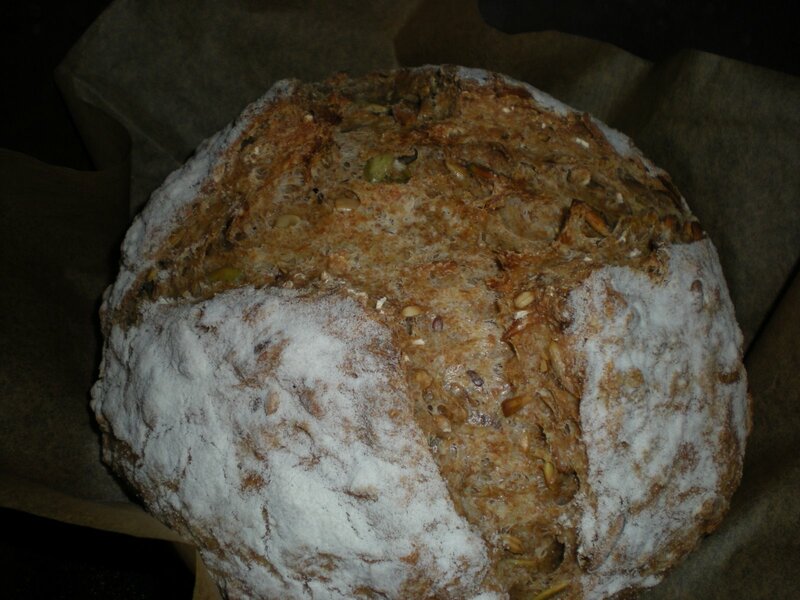 In a word, a brot. What is a brot? 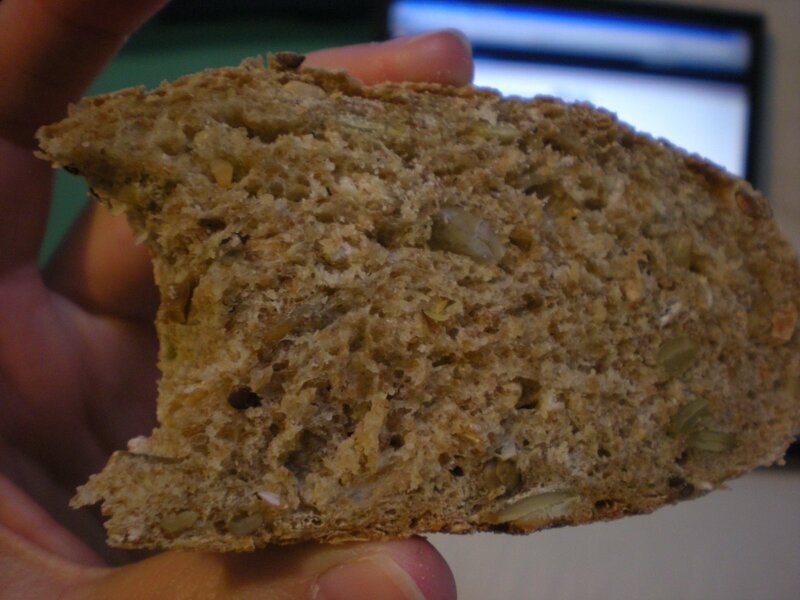 Specifically, it’s the German word for bread, but for me it also means the dense, hearty breads from Germany like volkornbrot, dreikornbrot, schwarzbrot. I found a few recipes from Peter Reinhart’s Whole Grain Bread, so last night I brought out the ingredients and put together the pre-ferments. 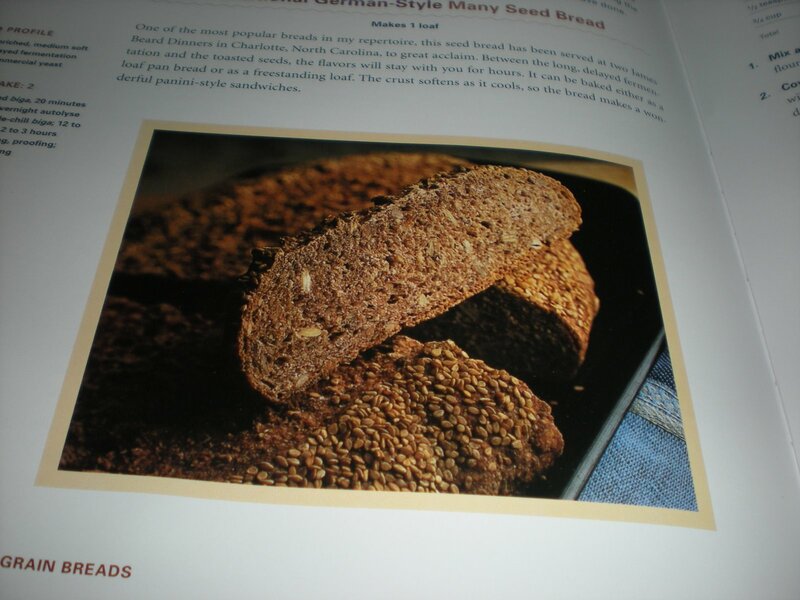 This recipe is for Reinhart’s “German Many-Seeded Bread,” found on page 210. Let’s get started! This bread is a transitional whole wheat, which means it’s not 100% whole wheat. My starter breads currently will never be 100% whole wheat just because my starter is refreshed with all-purpose flour, but maybe I will make a whole wheat starter one of these days. 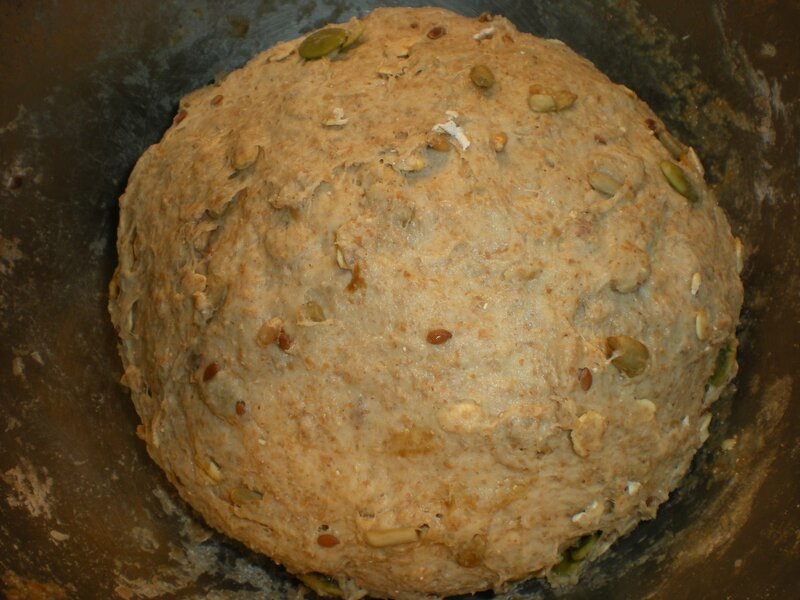 Anyway, this is what Reinhart calls our “biga,” a yeasted preferment with flour, water, starter and some salt. It rises overnight. This is what Reinhart calls the “soaker.” It has no yeast in it, but basically any seeds and grains that need to be softened overnight go in here. It is 100% whole wheat. I added wheat berries and flax seeds. More seeds will go in later. 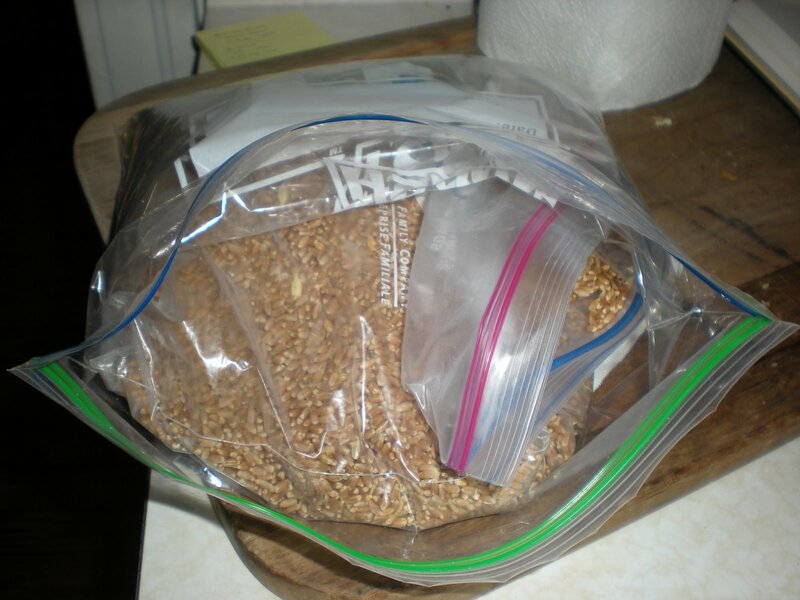 My bag of wheat berries I got at the Farmer’s Market! They aren’t so good milled and used as flour but maybe they will be tasty used whole. So I let both of these sit overnight covered in plastic wrap and a towel, and then combined them with honey, pumpkin and sunflower seeds, a little extra flour, and some commercial yeast. 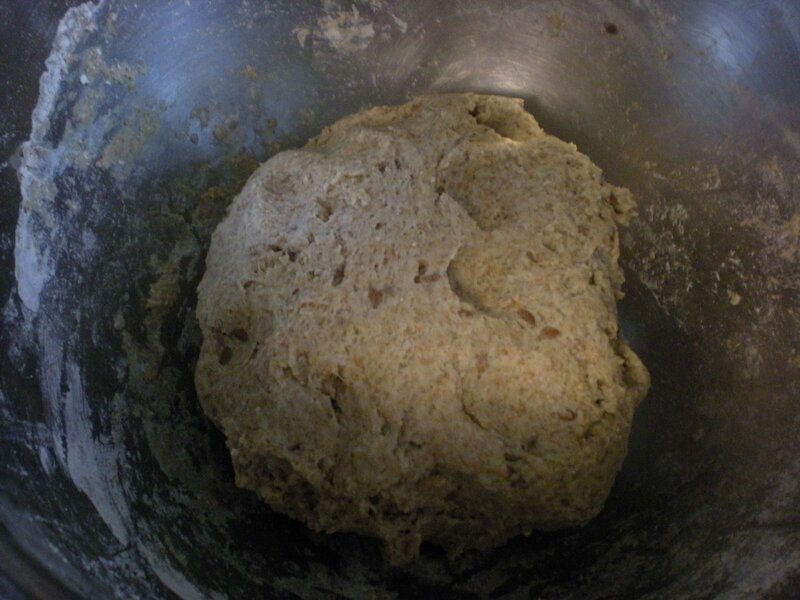 This was tough work as the high-gluten bread flour dough did not want to mix with the wheat dough. I can understand why Reinhart suggests you cut each pre-ferment into small pieces and then mix together. But I am too lazy for that. Then I let it sit for an hour and rise a little bit. I preheated the oven to 425 and slid my dutch oven in to warm up. 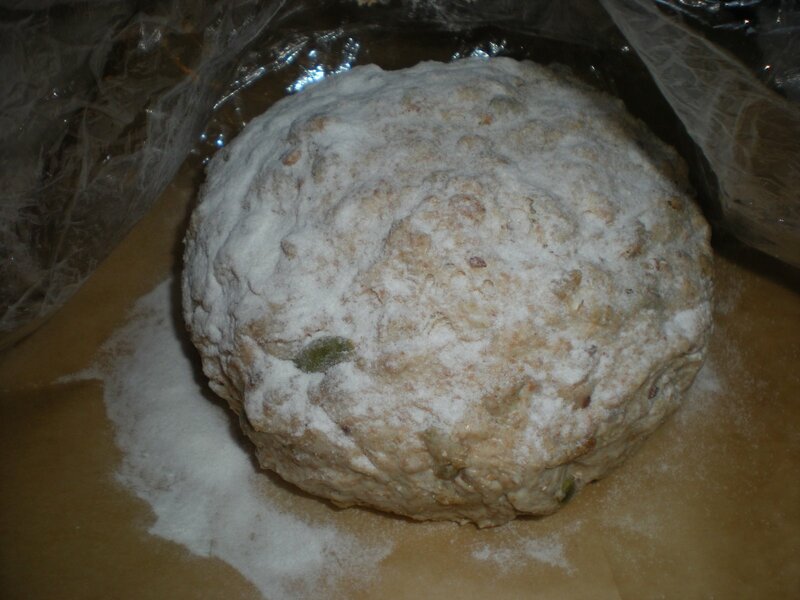 Then I moved the dough onto a piece of parchment paper and covered it with plastic wrap and a towel for its final rise. 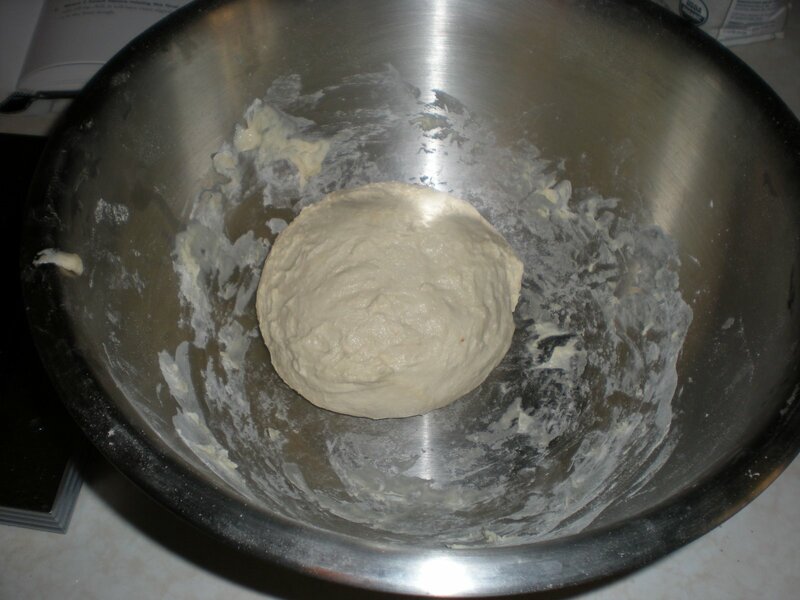 When the oven is ready, remove the towel and plastic wrap from the dough and score with a sharp knife or razor blade. Using the parchment paper as a sling, carefully open the dutch oven and place the bread into it, replacing the lid after. When the bread has baked for thirty minutes, take the lid off and bake for another twenty minutes. When the bread sounds hollow, remove it to a cooling rack. The parchment paper will come right off when the bread is cool. 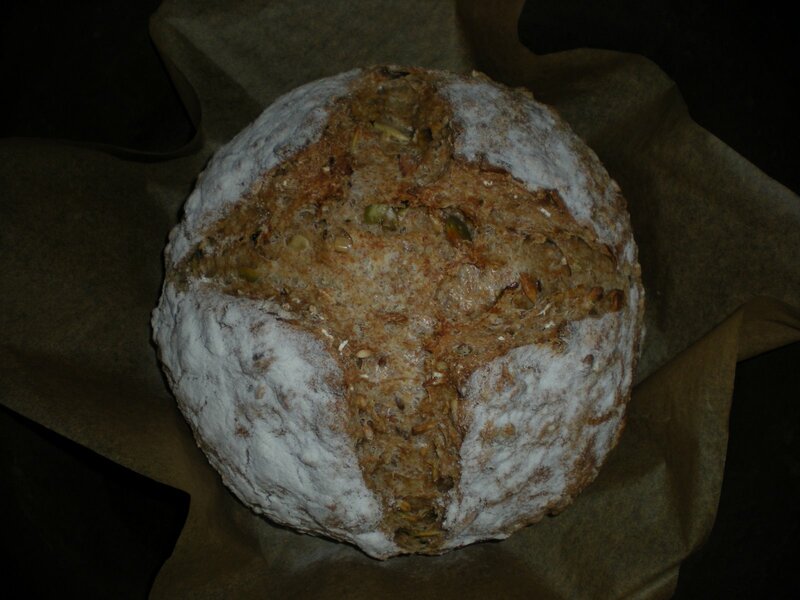 Why I like making bread from Peter Reinhart’s book: sometimes mine looks better than his. Take a look. A note to cookbook writers: it can give a new baker enormous confidence when your book is not full of impossible-to-obtain bread glamour shots. But how does it taste? Hearty, nutty, crunchy in parts, but overall incredibly soft and delicious. So, success! Next time, we take on Reinhart’s volkornbrot! Oh, that bread looks scrumptious! !